Carrickbyrne Hill, 7 miles east of New Ross, may be the modern name of Aird Leamhnachta, a height which is the subject of a Dindshenchas poem, in which it is said to be in Uí Cheinnselaig (HDGP). See Máire MacNeill, 'The Festival of Lughnasa' (pp. 227-28) for details of the festive assembly which took place on the Carrickbyrne Hill on 'Rock Sunday' or 'Fraughan Sunday' in mid-July. A grassy sward on its summit is called the Green Loft. 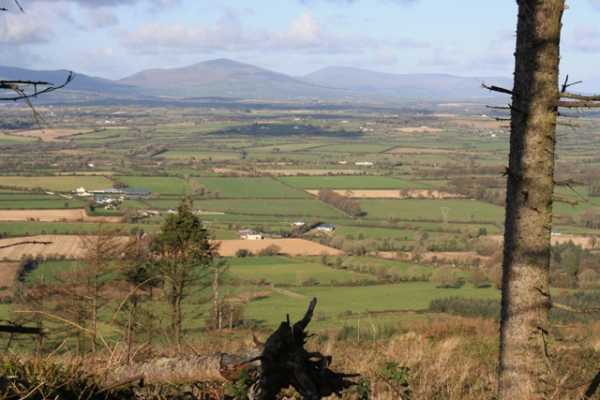 Carrickbyrne Hill is the third highest hill in the South Wexford area and the 1318th highest in Ireland. Just off the N25 there is a car park and information board at S 828 240 A (OS map 76). It is possible to drive further up the track to another car park in the forest. I had earlier tried to park on another public track at S 829 245 C, but there appears to be a car dealer who had the track blocked. The forest tracks on the map were accurate on the ground, and I used them to reach the col between Carrickbyrnes two summits. From the car this was only a 15 minute stroll. I made a logical guess that I would find a track at the col leading to the higher summit. This proved to be the case and Im sure it prevented a lot of scrabbling about in the dense undergrowth that flourishes here. This track is narrow and there are briars and gorse with some ducking and disentangling to be done, but it will lead all the way to the ragged Wexford flag which flutters from a tree near the summit Trig Pillar. The summit is a few outcrops with tangled undergrowth and forestry below. The best views are of the Blackstairs to the North and Slievecoiltia to the SW. This was interesting, not least because on Slievecoiltia a few kilometres to the SW is an inscribed stone which describes how Bagenal Harvey resigned his command on or around the 7th June a few days later!